Performed at AS220 Blackbox: Providence, RI. 2017. Part of La Luna Loba: Moon of Reversal and Release. Organized by Shey Rivera. 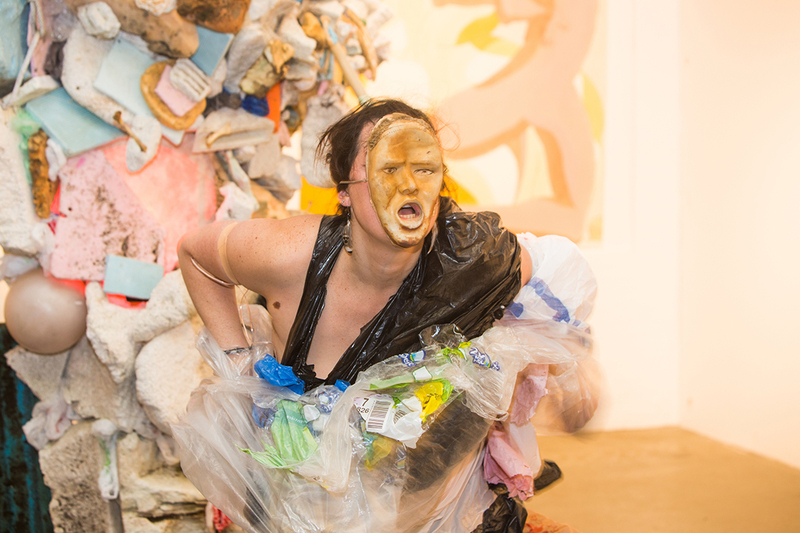 This performance is a practice of stepping back. 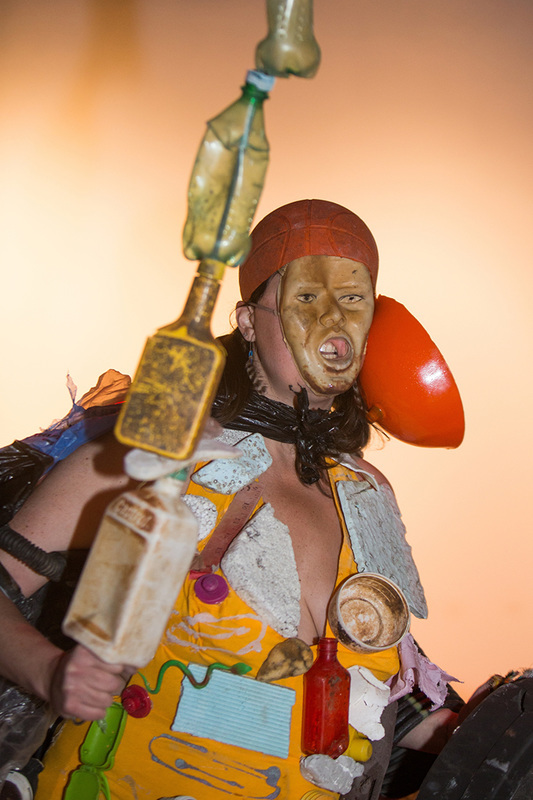 An environmental warrior carrying a bottle of trash-infused bay water enters, and begins shedding layers of identity. 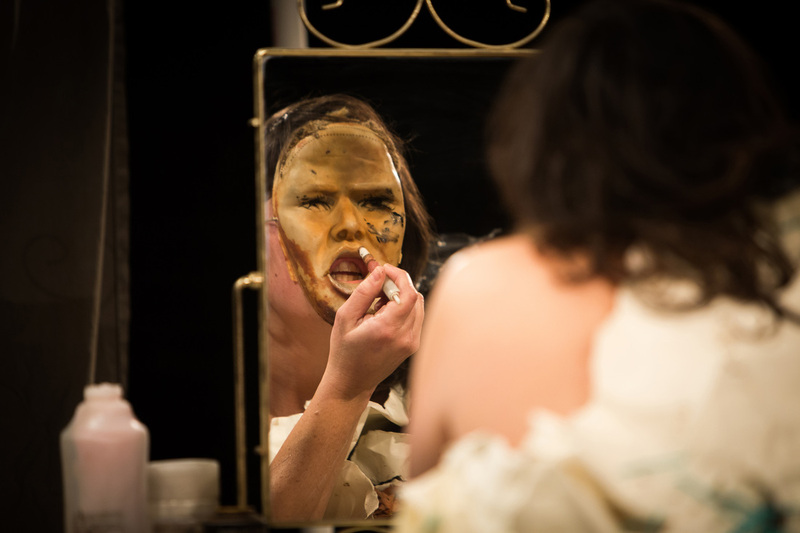 The American blow up doll mask is removed revealing the artist. Joan then ritually washes away her make-up with the trash water, lights a candle, and steps back. She joins in the collective moment of observation with the audience. Video by Corinne Wahlberg. Performed at Machines with Magnets: Pawtucket, RI. 2016. 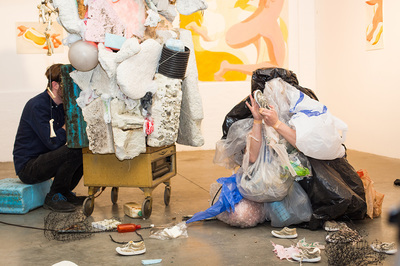 ​This in this trash-based performance, Joan Wyand appears as a bag lady as she carries in shoreline debris in a plastic bag on a stick. 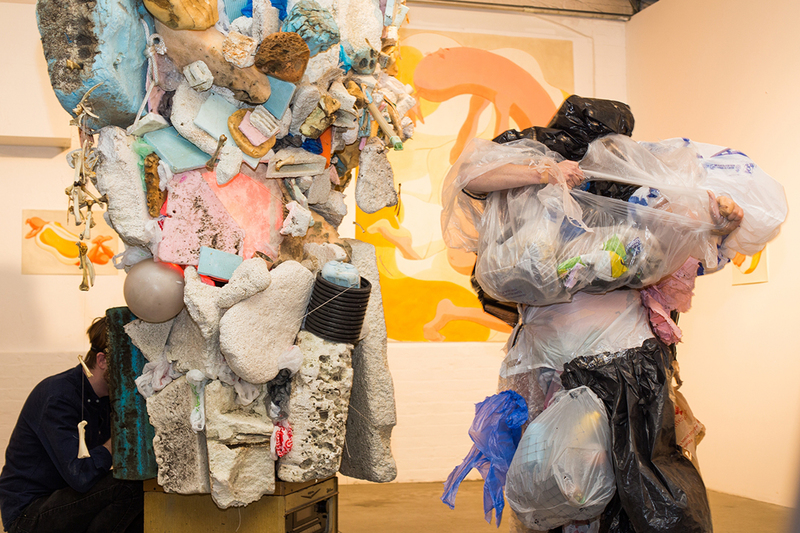 She transforms these materials into a super hero persona while creating a live looped soundtrack. ​Documentation by Stephanie Ewens! Performed at The Wurks: Providence, RI. 2016. ​This in this trash-based performance, Joan Wyand tears apart a plastic suit, releasing pockets of shoreline debris, while attached to a styrofoam sound sculpture. Using a contact mic, she records a live looped soundtrack. The styrofoam sound sculpture is a collaboration with Antonio Forte. ​Documentation by Stephanie Ewens! Performed at AS220 Black box: Providence, RI. 2015. 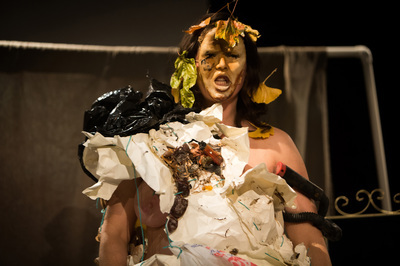 ​This in this trash-based performance, Joan Wyand applies discarded personal hygiene products collected from the East Providence shoreline and records a live-looped soundtrack at the AS220 Black Box Theatre: Providence, RI. 2015. ​Video by Stephanie Ewens! ​Performed at Dusk for the ladies showcase: Providence, RI. 2015. ​This in this trash-based performance, Joan Wyand sews a garbage suit and records a live-looped soundtrack for the Ladies Showcase at Dusk: Providence, RI. 2015. ​Video by Stephanie Ewens! Performed at Aurora: Providence, RI. 2015. ​This in this trash-based performance, Joan Wyand glues earth and trash materials onto a board and makes body prints while recording a live-looped soundtrack. Documentation by Stephanie Ewens!